Choosing a name for your website is hard. After you think of six good names, you will have to think up at least six more to find one that is not taken. I finally decided on fishingandhiking.com because it is simple and to the point. So who am I? My name is Grant Richie and to put it simply, I enjoy nothing more than hiking or floating in somewhere and doing some flyfishing. I live in northeast Oregon and it alone can provide a lifetime in exploration and flyfishing adventures. No matter where you are from, I hope this site inspires you to go out and explore your own neck of the woods. There are probably many adventures waiting for you within an hour or two of where you live you just need to get out a map and start looking. Most of my trips are two to three day weekend adventures within a few hours drive time from my house. The hike in or out may take more time than the drive to the trailhead. Sometimes my wife Lottie joins me for the weekend. 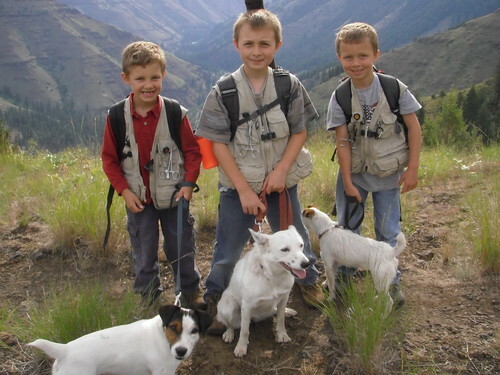 We are raising three boys Kolby 12, Brenden 11, and Mason 11 that love to get out and explore as well and when it is our weekend to have them at home I try to take them on an adventure that fits their age and abilities.We also have three dogs that often join us: Molly the white Border Collie, Loca the mostly reformed Jack Russell, and Motive the puppy Jack Russel (Mo for short unless I am yelling at Loca and Mo after they have given chase to some animal, then I call Loca-Motive which was the whole point behind naming him Motive). Beginning in 2011 Lottie and I purchased the Minam Raft Rentals, Minam Store, and Minam Shuttle Service business. Minam is not only the primary put-in for rafters heading into the 39 mile roadless stretch between Minam and Troy, but is at the center of great outdoor opportunities both easy and challenging from easy day trips on the Wallowa with exceptional rainbow fishing to more arduous hikes into the Eagle Cap Wilderness, Wenaha-Tucannon Wilderness, Umatilla Wilderness, and other great roadless places like the South Fork of the Walla Walla and Joseph Creek. In March of 2013 we purchased the Minam Motel letting our lease go across the river from the Oregon State Parks and moving the Minam Store, raft rental, shuttle service, and guide business across the river. Buying the Minam Motel has been one of our best moves. We can now plan long term for our family and business at Minam. Stop by and visit next time you are in our neck of the woods. Feel free to check out the website for our business at Minam. Lottie and the Boys at Rondowa. The boys before their first trip into the Wenaha. The boys getting their turn behind the oars so I can fish. Grant, it was nice meeting you today on the JD. Hope you had some good hookup on Tuesday. Like your website, nice job. Let’s see if we can go fishing soon. We have open seats for a possible Vets day run to the John Day. Dale told me about meeting you and mentioned inviting you friend. You’re more than welcome to come. Hey, just found your website. I really enjoyed reading your stuff. I spend a lot of time hiking and swinging for steelhead on the John Day, so that interested me greatly. I’ve also spent some time up in your area on the Imnaha, Grand Ronde, and Umatilla. I’m interested to read about some of the other rivers you fish as well. Keep up the good work and maybe we’ll meet on the river some day. Hey, I really like your website. I am thinking of hiking into the Wenaha River from Troy, OR to Crooked Creek at the end of March. With your experience, do you think this portion of the trail will be accessible? You should have no problem going up from Troy. I have went up in the middle of winter without any issues. The snow doesn’t usually stay long at Troy, its elevation is fairly low. Thank you Grant! Hopefully the trail won’t be too muddy, but I think it should be good. Just found your web site last night. 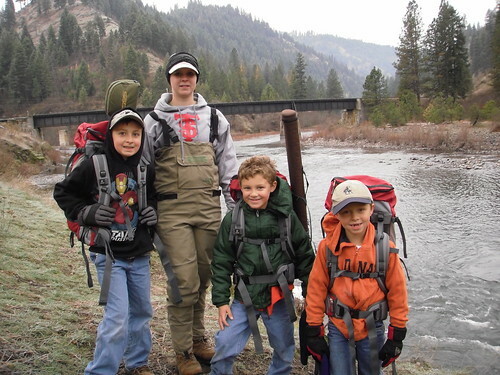 Great steelhead stories. I am going to the JD over Thanksgiving, in-laws are in The Dalles. Never have fished it but am going to try the lower portion of the river Rock Creek area. Any advice? I certainly don’t consider myself an expert on the John Day. I have only fished it a few times. I both nymphed and swung flies through there and caught fish both ways. Flies don’t need to be anything special, I caught them on a plain old olive woolly bugger and the simple egg. So my only advice is to go have fun and catch some fish. Catching steelhead is often about simple perseverance. Those that quit fishing early because they haven’t caught anything will often never catch anything. Fish the best water available well and enjoy being out there. If you are already having a good time being out there, a steelhead on the end of your line is simply a bonus. One more thought, if the fishing is slow I am never afraid to fish deep with a couple of split shot. Sometimes I think that makes the difference between a one or two fish day and getting skunked. Great site! I do a lot of fishing on the Grande Ronde, really enjoyed your pictures of the surrounding areas that I have never been into. I hiked the CDT a few years back, so I really enjoyed your images from the remote places. Thanks! Thanks Trey. I got my first SLR camera last fall and it has been a lot of fun learning how to use it. Hi Grant. Have continued to enjoy your trip reports. 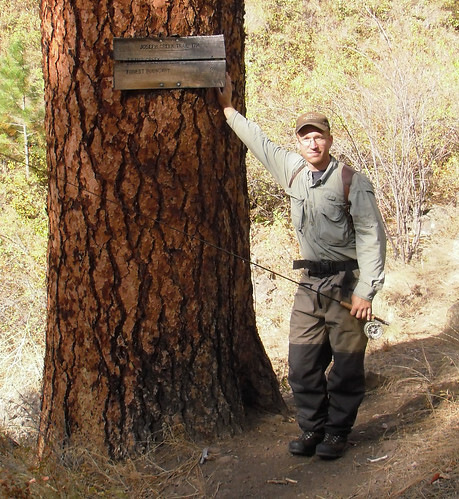 I have visited the greater Grande Ronde area for the past 11 Octobers,really enjoy throwing bugs for the steelhead, and the wilderness experiences available. 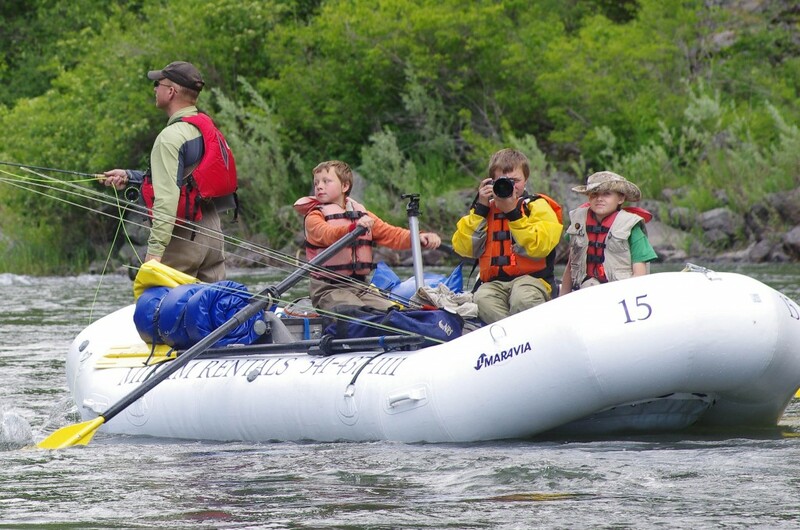 I wanted to ask your opinion, now that you have floated the Wallowa to GR 40 miles of wilderness a few times; do you think a Watermaster Kodiak or 9 ft. pontoon would be safe enough to handle the white water on that stretch w/40-50lbs of gear on board. Lots of times the Oct flow is 650-750, sometimes 1250 , just wondered your take after several trips? Have you seen many others in the small solo crafts floating the wilderness section? Thanks again for sharing your adventures and insights. I have seen people floating it in small pontoon boats and they often look too small for the amount of gear they have on the back, but 40-50 pounds would probably make them look more buoyant. I did see two watermasters this fall and they looked more capable of carrying a little bit of gear than the 8-9 foot pontoon boats. I noticed you hike a lot with your dog when you’re out fishing. Given that it’s some pretty snakey country, has your dog ever been bit? I didn’t start taking my border collie Molly with me on overnight trips until last year after I was stalked at camp by a mountain lion. I decided to take Molly for her ears and sense of smell as well as her companionship. I have not had any dogs get snake bit while I was hiking. I take Molly and our Jack Russels on a lot of day hikes close to home and we often find multiple rattlers on a hike. Last spring I ran into multiple dens in a single day with one den having at least 10 rattlers that I could count. Kolby was in fact standing on top of one and when the snake started rattling I lifted him up and swung him out of the way. It was early in the spring and I think the snakes were still a little slow. The biggest problem I had was keeping Loca (a Jack Russell) from attacking the snakes. She hates them. If you rattle anything that sounds close to a rattlesnake sound she will try to bite it. It must be instinct for her, although I wish her instinct was to stay clear. To give her credit, she is very quick and agile when she goes after them and tries not to give them a shot at her, but I would prefer she simply left them be. So to get to the point, the only problem I currently have is keeping Loca away from them when we run into them. I have to pick her up and carry her away. Can’t find you email here. I have a question about rod building. Thanks. I will go ahead and put that up on the page so it is a little easier to find. I am a Wallowa native that has been forced to live in “the valley”. 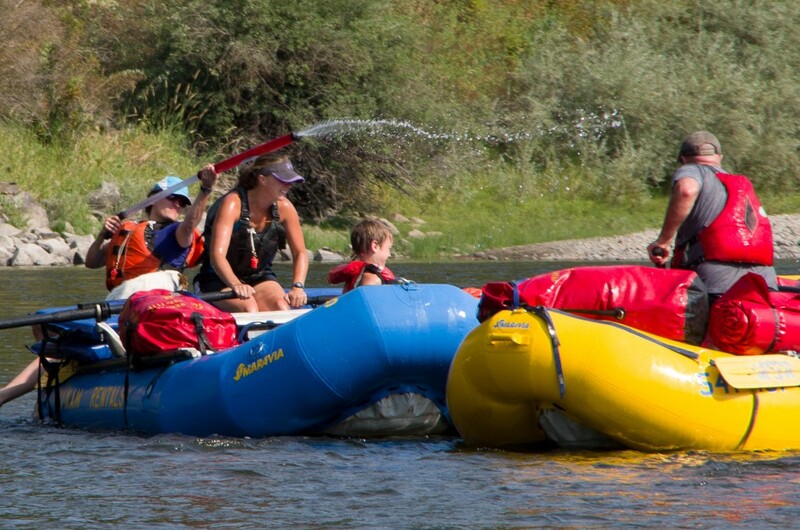 My parents still live in Wallowa, and my friend and I have booked a raft for the 28th of June–minam to troy. Good luck with the business. I do know two spots with large Bulls that you have not mentioned in any of your posts yet……………………………maybe you are keeping them secret too. 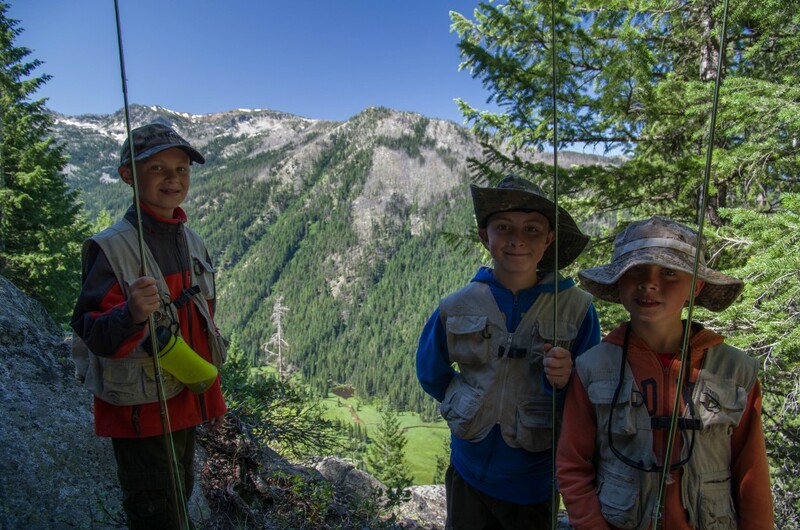 Big bull trout exist in almost all of our Blue Mountain and Wallowa Mountain streams although we are only allowed to target them in the Wenaha and the Imnaha. I catch them incidentally still in the other streams, I just don’t mention them since they are incidental catch in the other streams where I am targeting rainbows. Look forward to meeting you this summer. My oldest three boys and I used your shuttle service this weekend on a float and wanted to compliment you on your service. I enjoyed going through your blog and wish you and your family many adventures in the future.